Another Mind Magazine: How Do You Avoid Being Poisoned by Resentment?/Como Puedes Evitar El Ser Envenenado Por el Resentimiento? How Do You Avoid Being Poisoned by Resentment?/Como Puedes Evitar El Ser Envenenado Por el Resentimiento? 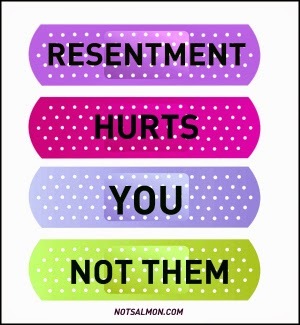 Do You Have Resentment towards your partner. Most people think, "All beginnings of a relationship are wonderful, but the end is always the same". I don’t think so. You can be happy forever as a couple if both of you learn to walk next to each other, with the same common goal and supporting each other as a couple. Perhaps one of the biggest problems is when someone hurts their partner, and the issue remains unresolved; when someone is keeping track in their mind of all the mistakes and failures of their partner. 1-Stop digging into the past. Someone told me once a story about a monk and his disciple on their way to the monastery; they had to cross a river. On the shore there was a very obese and elegant woman, who also wanted to cross, but the river was high. So the monk took her on his shoulders and carried her to the other side. As she laid her on the floor, the woman looked at them with disdain and left without saying thank you. The disciple was furious. He said nothing, but he was seething inside. They walked several miles in silence and, on reaching the monastery, the disciple, angry, turned to the monk and said, "She was so heavy ... and she didn't even thank us." The monk laughed; and said, "Yes, I took her across the river and she was heavy. But I left her in the river, many miles behind. You are still carrying her." The past is very heavy. It has sharp edges so that whenever you touch it your wounds grow deeper. Stop carrying it. When you leave the past in the past, when you stop considering what your partner said, did or should do and say, but did not, your life becomes much lighter. By talking people can understand each other and problems are solved or rather the indifference, the difficulties and the doubts. 2-Solve problems early at the right time to avoid anger. Let me tell you the story of a couple: I read in a book about this couple that was sweeping the backyard. A broom that was in the courtyard faced the sun, the rain, the air, every day: its handle was full of large splinters. Then, when the man was sweeping, he got a splinter on the ring finger of his right hand. He tried to get it out, but since he is right handed he couldn't, the more he tried to remove it, the more it got buried in his hand. The splinter was very large and painful. He thought of asking for help from his wife, but since she is a tough woman, who when she gets angry she can simmer on it for weeks. Weeks that would make him become the invisible man to her. When his wife finally spoke to him, and may have been able to help him, she reluctantly revised his finger, but since the splinter had pierced so deep into his finger it was not even visible. And though he could not see it, he could no longer bend his finger. This is why Paul said in Ephesians 4:26: “In your anger do not sin: Do not let the sun go down while you are still angry," If you let the sun set on your anger, when you wake up there is a chance that you will no longer find the splinters and these splinters will poison you. I think that if you have a problem with your partner, you should try to solve it that same day, no matter if you are tired, or don’t feel good, and your soul hurts from so much pain, you should not go to sleep until it is resolved. The next day, though sleepless, and tired of arguing about the same thing every time, maybe you'll feel a little bit better. He who becomes accustomed to sleeping with the problem unresolved, expecting that the night will "delete" these things, can make your partner find a liking to the taste of resentment. And it's something we want to avoid because we don’t want to lose our partner. 3-Obey the hardest law. Yes, the third, and perhaps the most difficult of all is simply to forget. We all know the story of the man who was bitten by a poisonous snake. He has time for only one thing, he either gets the poison extracted and he survives, or he searches for the snake to kill it, and they both die. An ancient Jewish legend says that after a long time, Cain and Abel met again, on a cold night, before a fire. Both remained a long time in silence, each beside the fire, until Abel says: "I can’t remember, please tell me: Was I the one who killed you, or did you kill me?” That is, I believe, the true measure of forgiveness. Bitterness and resentment are poisons that kill any happiness and sometimes the best we can do, although we have been hurt, offended and humiliated by our partner, is to stop digging into the past, reproaching everything in which we have failed both to ourselves and our partners, and to solve things on time so we can discuss any questions you have about a specific issue, forget, and communicate more, and be more united as a couple. Sometimes we feel weak; powerless to forgive and we forget to heal these deep wounds that have caused us some kind of resentment, and we don’t “forgive and forget”. If you need spiritual help, ask for it. We call it prayer. Prayer is a powerful spiritual medicine. I recently saw in a book something that that great master, Henry B. Eyring, said: no two families are alike; so no specific tips will work for everyone, there isn't just one path to happiness. We all want to be happy with the people we love (our partner) and to keep all the commandments of the Father. That does apply to everyone. When Jesus was asked what the greatest commandment of the ten was, he said two who were not among them, and can be summarized in one: "Love". Surely that will lead to forgiveness and this in peace. What is your experience with this? 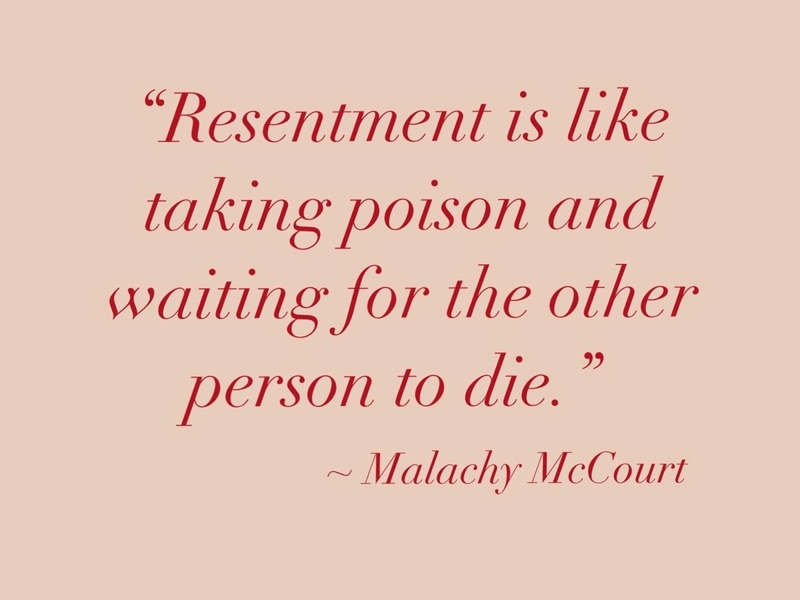 Comment Below and tell us how do you avoid Resentment in your life? Tienes Resentimientos Hacia tu pareja? La mayoría de personas piensan: “Todos los inicios de una relación son maravillosos, pero el final es siempre el mismo”. No pienso lo mismo. Se puede ser feliz por siempre en pareja si ambos aprenden a caminar el uno al lado del otro, con un mismo objetivo en común apoyándose uno del otro como pareja. Acaso uno de los problemas más fuertes se da cuando alguien lastima a su pareja, y éste queda sin solucionar; cuando alguien lleva en su mente una especie de libro de cuentas con los errores y fallas de su pareja. 1-Deja de hurgar en el pasado. Una vez una persona me contó una historia y cuenta sobre un monje y su discípulo, de camino al monasterio, tenían que cruzar un río. En la orilla estaba una mujer muy obesa y elegante, que también quería cruzar, pero el río estaba muy alto. Así que el monje la subió sobre sus hombros y la llevó hasta la otra orilla. En cuanto la depositó en el suelo la mujer los miró con desdén y se fue, sin decir gracias. El discípulo se puso furioso. No dijo nada, pero hervía por dentro. Recorrieron varias leguas en silencio y, al llegar al monasterio, el discípulo, enojado, se volvió hacia el monje y dijo: “Era tan pesada… y ni siquiera nos dio las gracias”. El monje se rió; dijo: “Sí, yo la llevé y era pesada. Pero la dejé en el río, muchas leguas atrás. Tú todavía la estás cargando”. El pasado es muy pesado. Tiene orillas tan filosas que cada vez que las tocas tus heridas se hacen más profundas. Deja de cargarlo. Cuando dejas el pasado en el pasado, cuando dejas de considerar lo que tu pareja dijo, hizo o debió hacer y decir, pero no lo hizo, tu vida se vuelve mucho más ligera hablando las personas se entienden y se solucionan los problemas o mas bien las indiferencias, dificultades y dudas. 2-Soluciona los problemas a tiempo en el momento indicado para evitar enojos. Permíteme contarte la historia de una pareja: que leí en un libro barría el patio de su casa. A la escoba, en el patio, le daba el sol, la lluvia, el aire: su mango estaba lleno de grandes astillas. Entonces, al barrer, él se clavó una astilla de un poco grande en el dedo anular de la mano derecha. Trató de sacarla, pero como él es derecho, mientras más trataba de sacarla más se enterraba. La astilla era muy grande y dolorosa. Pensó en pedir ayuda a su esposa, pero es una mujer dura, que cuando se enoja puede durar semanas saboreando el dulce líquido de su anticongelante espiritual. Semanas en las que él se volvía, para ella, el hombre invisible. Cuando por fin su esposa habló, y pudo haber ayudado, de mala gana revisó su dedo, pero ya la astilla se había clavado tan profundamente en su dedo, que ni siquiera era visible. Y, aunque ya no se veía, él ya no pudo volver a doblar igual el dedo. Por eso dijo Pablo en Efesios 4:26: “No se ponga el sol sobre vuestro enojo”. Si se pone el sol sobre tu enojo, cuando te despiertas ya no encuentras la astilla y esas astillas te envenenan. Bueno pienso y creo que lo mejor que si tienes que arreglar algo con tu pareja, aunque te desveles, no te sientas bien de ánimos te duela hasta el alma de tato pelear no te duermas hasta que quede solucionado. Al otro día, aunque desvelados, cansados de discutir por lo mismo cada vez, te sentirás tal vez un poco mejor. Quien llega a acostumbrarse a dormir con el problema sin resolver, en espera de que la noche “borre” las cosas, puede hacer que su pareja le encuentre el gusto al resentimiento. Y es algo que queremos evitar ya que no queremos perder a nuestra pareja. 3-Obedece la ley más difícil. Sí, la tercera, y acaso la más difícil de todas es, simplemente, olvidar. Todos conocemos la historia del hombre que fue mordido por una serpiente venenosa. Solo hay tiempo para una cosa: o se extrae el veneno y sobrevive, o busca a la serpiente para matarla, y mueren ambos. Una antigua leyenda judía dice que, después de mucho tiempo, Caín y Abel vuelven a encontrarse, una noche helada, ante una hoguera. Ambos permanecen mucho rato en silencio, cada uno de su lado del fuego, hasta que Abel dice: “Ya no lo recuerdo, dime por favor: ¿fui yo el que te mató, o tú me mataste a mí?”. Esa es, creo, la verdadera medida del perdón. La amargura y el resentimiento son venenos que acaban con cualquier felicidad y, a veces, lo mejor que podemos hacer, por mucho que hayamos sido lastimados ofendidos y humillados por nuestra pareja, es dejar de hurgar en el pasado, echar en cara cada cosa en la cual hayamos fallado tanto a nosotros mismos como a nuestra pareja, es solucionar las cosas a tiempo hablar para que podamos aclarar cualquier duda que tengamos en cuanto a un tema específico olvidar, comunicarnos más y estar más unidos como pareja. A veces nos sentimos débiles, sin fuerzas para perdonar olvidar y curar esas heridas tan profundas que nos han causado algún tipo de resentimiento, y tomar esa medicina que es el olvido. Si necesitas una transfusión de ayuda espiritual y hasta emocional, pide por ello. A eso le llamamos oración. El orar es una medicina espiritual poderosa. Como dijo recién vi en un libro algo que dice ese gran maestro, Henry B. Eyring, no hay dos familias iguales; así que no hay consejos específicos que funcionen tal vez, pero hay un mismo sendero a la felicidad. Todos deseamos ser felices junto a la personas que amamos (nuestra pareja) y ese es seguir todos los mandamientos del Padre. Eso sí se aplica a todos. Cuando le preguntaron a Jesús cuál era el mandamiento más importante de los diez, dijo dos que no estaban entre ellos, y que pueden resumirse en uno: “Ama”. Sin duda eso te llevará al perdón y éste, a la paz. ¿Cual es tu experiencia con esto? ¿Cómo tu evitas el Resentimiento en tu vida?